Use Common Spatial Data Shared to All Users (Topo Maps, Cadastral Boundaries, Roads, Streams and more)? Making maps is all about having access to spatial layers which provide layers such as roading, streams and contour data. Within the Interpine Forest Management Cloud we publish common spatial datasets centrally for all registered users to access. This not only saves on storage space meaning each client does not need to store this same common information, but means all users have commonly used spatial layers at hand, rather than needing to locate, source and have these available for use in the Forest Management Cloud. There is a range of datasets available depending on your access rights and the source provider’s data provision license requirements. 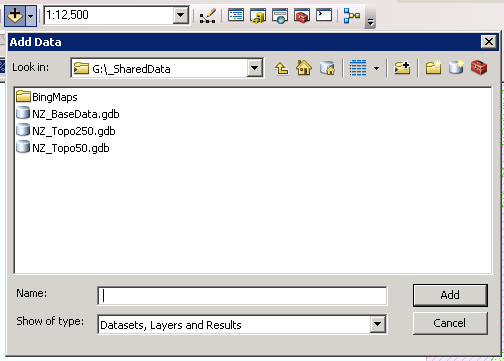 You will find a set of ArcGIS Geodatabases available for read only access in G:/_SharedData. Here are just some examples of what is available, although this is not a complete list as it will depend on your security rights exactly what you see here. NZ_BaseData A wide range of NZ base information important for forest management in NZ, from soils layers, NZ topo vector data, territorial authorities, MPI wood supply regions, cadastral layers, maori land, DOC land, rainfall, coastline, rural fire authorities, land use class. Select to add data, and if needed connect the folder above. this information is published for ease of use for clients within the Forest Management Cloud environment. Users must always check currency of the datasets to ensure they are happy with the information at date of publishing. Some datasets have access restrictions due to data providers licensing requirements.